This is the quintessential summer smoothie. It's supercharged with vitamins A and ß-carotene (which converts into vitamin A in the body). As you probably already, know Vitamin A is not only essential for vision, it's THE nutrient for maintaining a healthy skin. Carrot juice, orange juice and peaches. Three incredible sources of Vitamin A. What do you want more? But this smoothie doesn't stop there. It's also packed with Vitamin C, potassium and a whole array of antioxidants and nutrients that are super good for you. Without hesitation, I can say that this is my GF fave smoothie. She always asks me to make one for her before going to the beach. She says that drinking this smoothie it's like putting an extra layer of sunscreen on the skin. Believe. As usual I like to add a scoop of protein powder, but that's just me and you might as well leave it out. 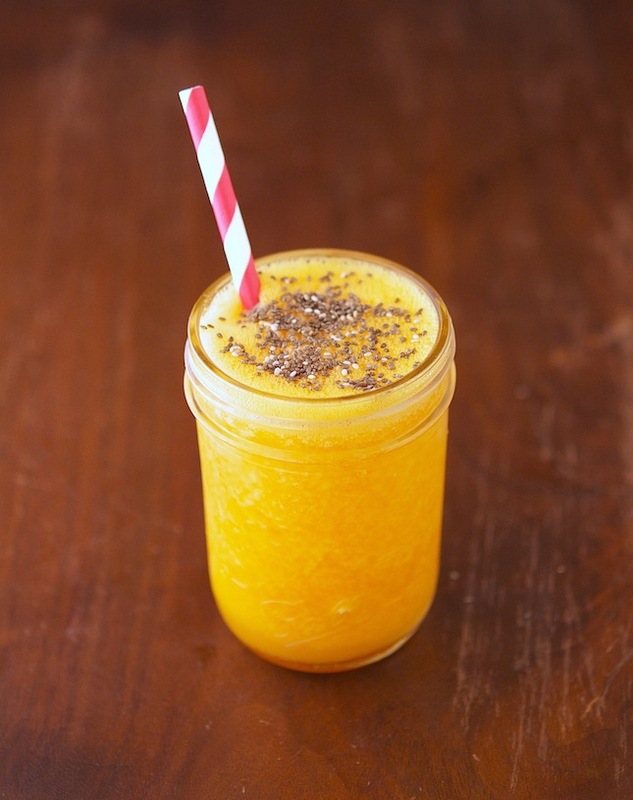 Carrot Orange Protein Smoothie Print this Recipe! Place all the ingredients in a blender. Pulse until well blended. Serve chilled. One serving of this smoothie (with protein powder) scores 250 calories, 1.5 grams of fat, 43 grams of carbs and 22 grams of protein. You can submit your carrot orange protein smoothie pics on http://www.foodporn.net It is a food (and drink of course) photography site where members can submit all food (and drink of course (again) LOL ) pictures that make readers hungry. Adding in some ginger to this would be great. Drinking Ice Cold Water Burns Fat! True or False? NYC Ban on SuperSize Sodas: Helpful Or Not? Bananas Are Better Than Any Sports Drink!